is the perfect getaway for a trip to the interior of Alaska. While winter isn’t always considered the prime time to visit the Last Frontier, many travelers actually prefer to explore Fairbanks in colder months, thus avoiding the hustle and bustle of the popular tourist season. There is no shortage of recreational activities or attractions in the Golden Heart City. Highlights include northern lights viewing and a visit to the Fairbanks Ice Museum, or try holiday shopping and a wide range of other indoor and outdoor activities. 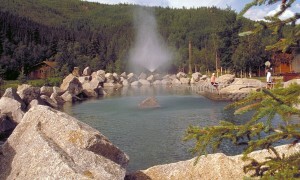 Hot springs have a long history in Alaska’s interior. Even in the earliest years of settlement, pioneers and gold miners made the trek out to the springs. Chena Hot Springs and Manley Hot Springs are the two most popular destinations for travelers, and both are open to the public year-round. You can make a day trip out to Chena Hot Springs before heading back to the Fairbanks Princess Riverside Lodge. Manly Hot Springs is more remote and requires some planning in advance. Fairbanks is the perfect jumping off point for either. You will find few things beat the experience of soaking in hot steamy waters under a clear, crisp sky with unobstructed views of the northern lights dancing across the sky in green, red and white hues. If you’re looking to sample a taste of local cultural talent, check out the Annual Athabascan Fiddle Festival in November. The event, held at the Chief David Salmon Tribal Hall in Fairbanks, guarantees fun for the entire family. This video featuring the 2011 handkerchief dance – performed by locals each year at the festival– is a sneak peak of some of the fun to be had at this one-of-a-kind cultural event. An abundance of exciting opportunities is available for locals and visitors alike to explore Fairbanks during the colder months. Don’t make the mistake of staying home and missing out on all the fun to be had during this fabulous time of year.